The trendiest sun spot of Calais, Rue Royale is the most colourful shopping street with lots of boutiques, bars, cafes and shopping malls. Greatly modernised over the last few years, new outlets have been opened up and the stylish Passage Royale has also been created. It’s also a perfect place for a nice evening stroll with friends and loved ones. For a list of shops refer Website. Best to visit during January and June as it is Sale time. Most shops in Rue Royale are open between 9:00 am and 7:00 pm. From Mondays to Saturdays. Not much is open on Sunday. Overloading the car with Alcohol can get you fined. Check website for advisory custom 7 excise limits. Eurocheques generally not accepted these days. Hence pay by credit card or cash. For the list of important and famous shops, outlets and cafes check website. How popular is Rue Royale? 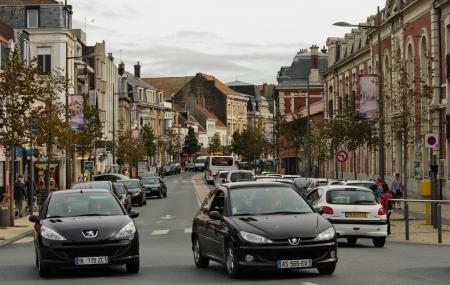 People normally club together Eglise Notre-dame and Casino Le Touquet's while planning their visit to Rue Royale.